Artlands is a contemporary art programme which will explore North Kent’s identity through a series of public realm commissions – responding to and engaging with the unique qualities of the area; its landscapes, its heritage and its people. Artlands will create multiple and varied opportunities for artists to work in North Kent and will be a cumulative programme, beginning with the delivery of four commissions which respond to specific opportunities within the region. 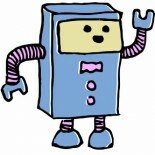 This entry was posted on 22/02/2013 by Creatabot in Creative Communities and Inspiring Websites.